Lang Son (VNA) – Tam Thanh pagoda is a must-see destination for tourists visiting the northeastern mountainous province of Lang Son. Amid the hustling city of Lang Son, the in-cave pagoda welcomes flocks of tourists and pilgrims thanks to its rich spiritual, cultural and historical values. 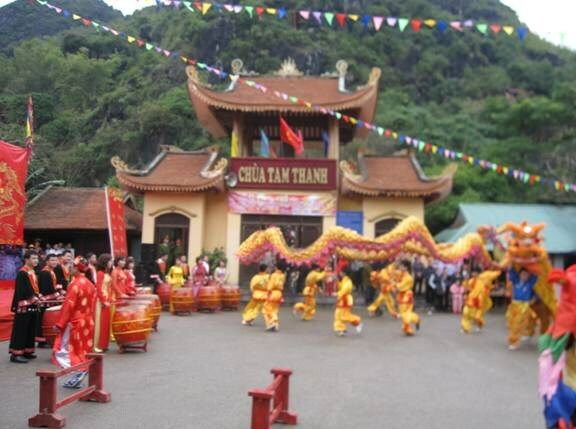 Tam Thanh pagoda was built for Taoism worshipping during the Le Dynasty, which reigned from 1442 – 1789. However, as Taoism’s position in society faded, the venue was turned into a worshipping venue for Buddhism and Mother Goddesses. Tam Thanh pagoda is a must-see attraction in any tour to Lang Son province. According to Hoang Minh Thien, Tour Guide,Tam Thanh and Nhi Thanh are the most outstanding tourist attractions in Lang Son city. The sites have a significant spiritual value and were recognised as a national historical and cultural relic site in 1962. They welcome 200,000 tourist arrivals per year. Tam Thanh pagoda is home to various religions with statues and steles standing for centuries. One of the most noticeable statues in the cave is the Amida Buddha, casted in 16th century. Besides contemplating religious, historical and artistic values, many visitors come here to enjoy the breathtaking and mysterious beauty of the centuries-old worshipping venue. Nguyen Bao Lam said he has always wanted to visit Tam Thanh pagoda as it is mentioned in many old sayings and folk songs. He was amazed when first stepped in this pagoda, saying that the pagoda is different from any pagodas he has visited as it is in a cave.